"By the time Cedar Walton came to make his first LPs for Prestige in 1967, he was without question the finest unrecorded pianist in New York." 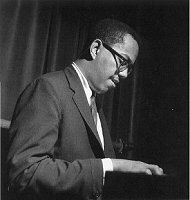 Cedar Walton was taught piano by his mother and studied music at the University of Denver (1951-54). In 1955 he went to New York to play jazz but was drafted into the army, and, in Germany, played with Leo Wright, Don Ellis, and Eddie Harris. After returning to New York he recorded with Kenny Dorham (1958), then played in J.J. Johnson's group (1958-60) and the Jazztet (1960-61). Later he recorded with Art Farmer (1965, 1975-77). From 1961 to 1964 he was a member of Art Blakey's Jazz Messengers with Wayne Shorter and Freddie Hubbard. After a period as accompanist to Abbey Lincoln (1965-66) he recorded frequently with Lee Morgan (1966-68) and worked as house pianist for Prestige (1967-69), then re-joined Blakey for a tour of Japan (1973). From the mid-1960s Walton has performed frequently as the leader of a traditional bop quartet with Clifford Jordan, George Coleman, or Ralph Moore, and Sam Jones or David Williams, and Billy Higgins; in 1975 it took the name Eastern Rebellion. As leader of the group Souindscapes in the mid-1970s he experimented with funk rhythms and the electric piano. He later toured the USA, Europe, and Japan as the leader of a trio, which often included Higgins. Walton has also performed as a soloist, in duos with various double bass players, and from around 1981 as a member of the Timeless All Stars. A selected discography of Cedar Walton albums. Plays Cedar Walton, 1967-69, Prestige. Eastern Rebellion, Vol. 1, 1975, Timeless. Live at Maybeck, 1992, Concord.